It has been a long winter with rainfalls extending through the beginning of June. Throughout the winter we tasted some smoky and intense cocktails. Libations that as soon as they are sipped brought warmth and comfort from this cold and harsh winter. As the weather is getting better, my steps always lead me to my favorite summer hangouts in Bushwick. Heavy Woods, with their great outside tables, is one of them. This is where my first collaboration with Gustavo Ponce started, as I was drinking last summer's favorite summer cocktail; the Kiss and Tell. Almost a year later, and the Heavy Woods' cocktail list has changed. After a few attempts at getting the bartenders to make me a Kiss and Tell, I decided to move forward and find another summer drink. Because what is a great summer hangout without a drink to go with it? Last week I scoured through the cocktail list, and I found it. When you find the cocktail that you need on a cocktail list, it is like love at first sight, and that was the case for me and the Brigg's Cup. A cocktail that I am ready to commit to a monogamous relationship with for the rest of the summer. 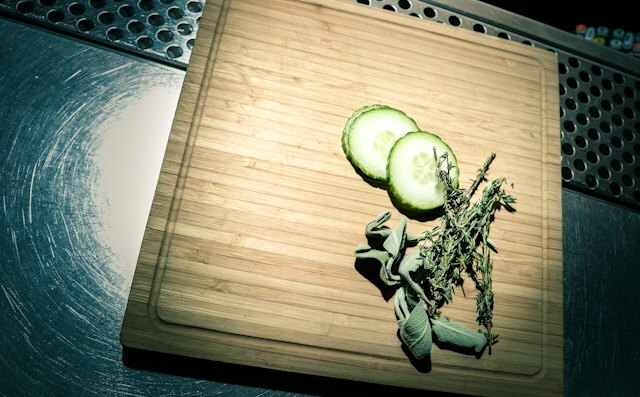 Cucumber and fresh sage and thyme make up for an impressive cocktail. You know you are in love when you see somebody and everything stops around you, and that's the only person in the room. As I was sitting in one of the outside tables of Heavy Woods, a Brigg's Cup was brought over to me, and everything stopped. No other cocktail was around. The garnish of the fresh sage, thyme and cucumber made my jaw drop. The first sip was magical; the acidity from the lemon was right, and the ginger beer gave a great kick to the cocktail. Unlike another Pimm's cup that I just recently tasted, the Brigg's Cup had strength to it due to the use of Beefeeater gin. 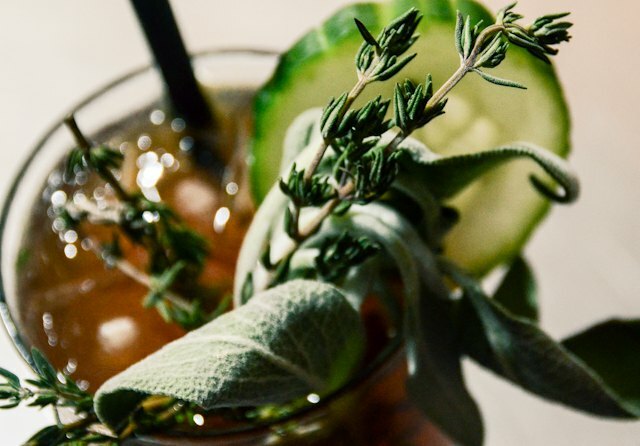 While the cucumber, sage and thyme create a delight for your nose, the herbaceous tasting background is complete with the lavender note coming from the Amaro Lucano. Last but not least, Pimm's just brings this beautiful taste that every cocktail-drinking person has been craving since the last summer ended. Mandy Jo building the Brigg's Cup. There are few standards in life and one of them is that a good Pimm's Cup is the official summer drink for a lot of people. 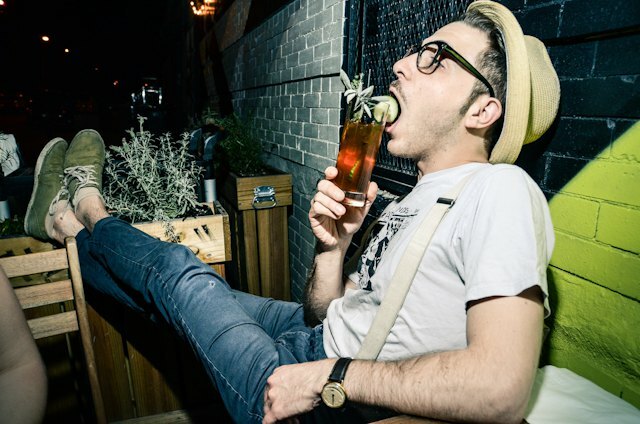 "It's such a great mix of fruits and spices," says Chris Busse, who first tasted a Pimm's Cup made by his aunt in the English beach town of Bournemouth. Ever since then, this concoction reminds him of summer afternoons. But the Brigg's Cup is so much more: it's a rich drink that says a lot about the place in which it is consumed. 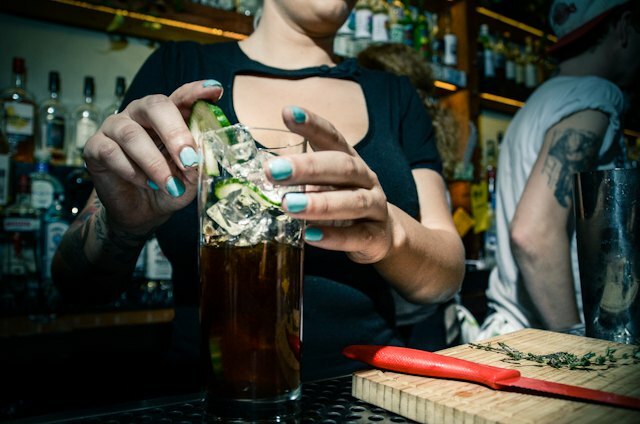 The drink came to be as Kiki, the creator, was throwing ideas around with her friend Jason Briggs, hence the name of the drink. For her, the Brigg's cup is "just a really refreshing and boozy summer cocktail!" Savoring the Brigg's Cup's garnish. When you fall in love, not only does the world around you stop, but you also tend to forget anything from your past. As much as the Kiss and Tell lies deep in my heart, I have to admit that this post will be the last time that I remember that drink. From now on, the only drink that I want to spend my summer nights with at Heavy Woods' outside tables will the Brigg's Cup, and nothing will ever come between us. The Brigg's Cup is served at Heavy Woods, 50 Wyckoff Avenue for $12.